Sometimes, the only way to get to your destination is by car. In fact, some of the most beautiful and remote areas of the state can only be reached by driving. Make the most of the ride by traveling along one of many scenic byways that wind through the state. And if you need directions or lodging along the way, click on the map showing the locations of Maine's Visitor Information Centers. on these unique Maine driving routes. Know before you go. 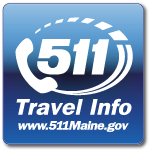 Check with 511 before you take to the road for up-to-the-minute travel information. Find out about road conditions, weather, construction, accidents or any major delays before they affect your drive. Anytime youâ€™re on the road in Maine, 511 will keep you in the know. There are many visitor centers throughout Maine. View a list of Maine's Visitor Centers. There are many taxi services available throughout Maine, some of which offer 24 hour service. Click here to download a list of taxis (PDF).